so you can tell that i seem to like small things and think much of the time about artifex, boston, and good food. hm! 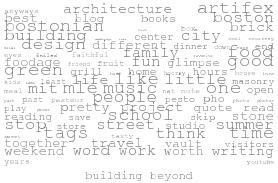 but to create the actual tag cloud widget to the right >>, i found this handy bit of code on this frivolous motion blog. again, it's no frills but does the trick while working with blogger's widgets.